You can test your video camera with Zoom before joining the meeting to ensure that the camera is working correctly. The steps below will walk you through testing your video manually. You can also start a test Zoom meeting. You will see a preview of your camera and can choose a different camera if needed. Click the arrow next to Start Video / Stop Video. Zoom will display your camera's video and settings. If you don't see your camera's video, click the drop-down menu and select another camera. You can also rotate your camera if needed. Read more about rotating your camera. Click the arrow next to Start/Stop Video. This will open up your video settings and you can change your camera. 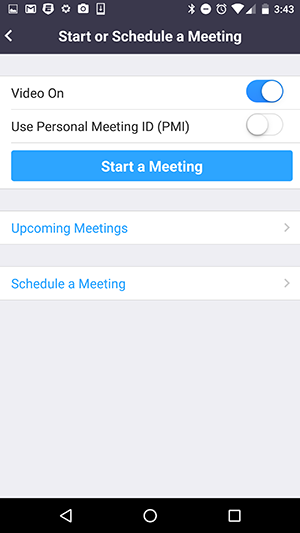 With the Zoom mobile app, you can start an instant meeting to test your video. If this is your first time joining a Zoom meeting from this device, you will be asked to allow Zoom permission to access the camera and microphone.